Crosswalk Detour: I saw the sign! It’s exciting to see Bluffton’s new crosswalk signs at Main St. and College. This is a great improvement for students who cross before and after school, and for all pedestrians who need to cross at this intersection. I’ve been talking with the Village of Bluffton and ODOT about creating more “enhanced conspicuity” so that the signs replicate the message of the in-street design originally recommended by ODOT. 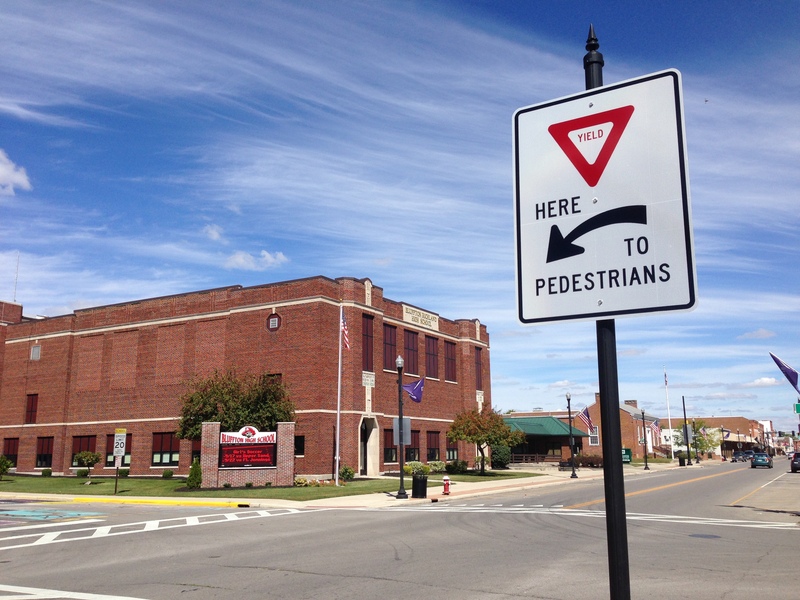 It would be the “icing on the cake” to add yellow-green plaques reading “STATE LAW” and “SCHOOL XING” to emphasize the fact that drivers are required to stop for pedestrians. A large majority of drivers fail to yield to pedestrians, cyclists and people in wheelchairs. Some drivers crowd crosswalk users, stopping in the intersection close to the crosswalk or even threading between individuals in the crosswalk. Some drivers yield but when others in the second lane do not stop, some pedestrians balk and do not proceed. Drivers who do stop sometimes get honked at by irritated drivers behind them. Drivers are worried that they will be rear-ended if they stop. While the duration of after-school congestion is short, it’s just not acceptable to let drivers ignore the law. If you stop for pedestrians, thank you! 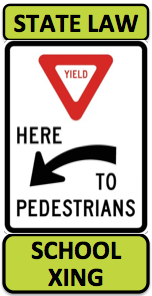 Modeling the correct behavior is an important way to re-educate fellow drivers about yielding to pedestrians. Make eye contact and stay stopped until the pedestrians have crossed. At the same time, we need to educate students on how to cross safely. When students waive drivers on it’s not because they have a “I’m in no hurry, go ahead” attitude. It’s because they don’t expect other drivers to stop. Without a traffic signal, we still haven’t solved the problem for drivers on College who need to cross or turn onto Main St. I’ll be observing this area and will report back on my findings. In the meanwhile, let’s all share the road! excellent work Paula. I notice that drivers are very polite at our 4 way stop on Elm and Lawn, often urging the other to go first. I don’t think it is rudeness; it is lack of education. Thank you for continuing to work on this, Paula! Signage will help make it safer for pedestrians, though I still miss the light. As a driver on College Ave, I always feel like I’m rolling the dice when I cross Main. At least it is better now that the parking spots right adjacent the intersection have been removed. Thanks! Hopefully, we’ll know soon if the traffic study conducted earlier this month will result in the light being returned!